Really. The term 'astronomical' evokes images of billions and billions of stars millions of light-years away. But even on the immense scale of the universe, worlds can change in minutes—including ours by the way. Take, if you will, an event observed in 1572 by Danish astronomer Tycho Brahe. Something flared up in the atomic mechanism of a star’s nucleus and it exploded. Anyone unlucky enough to be visiting one of the star's planets would have seen their local sun swell, not a little but a lot. Within a quarter of an hour observers would have been forced to seek useless shelter against global warming like we've never dreamed. In half an hour all life died—except perhaps for some hardy bacteria that managed to survive a bit longer. After an hour, the seas and ice boiled; after three, rocks melted and mountains crumbled into valleys and melted into lava. After ten hours, the entire planet was reduced to vapor. All life, all matter was gone. Traveling at the speed of light, 7500 years later, that very bright star unexpectedly appeared in the constellation Cassiopeia and was observed by Tycho and the nova was named after him. Shakespeare saw it too, and described it as a "star that's westward from the pole" in Hamlet. A remnant blue shock wave of twenty million degree Celsius gas is visible today (Hubble photo above). 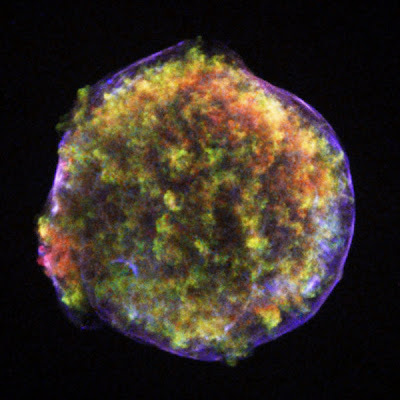 It was all over in a few hours, but the remnants of the explosion continue to expand today, almost 10,000 years later, leaving stellar debris with a temperature of about ten million degrees visible as mottled yellow, green with red fingers of hot gas.